Condom from the Latin condere, meaning to hide or to protect. in the 20th century, liquid latex was used to create the modern Trojan condom. 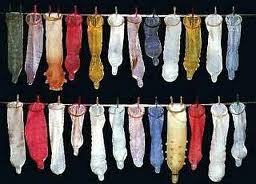 Today, in this 21st Century, condoms come in all shapes, textures, colors and flavors...and for both sexes! You can pick one up at school, at bus stops, night clubs, pharmacies, hotel gift shops, airports...everywhere. Hell, there is even an APP to find the store nearest you that sells condoms. Will wonders never end? COMMENT: What's your favorite type of condom? flavor? Do tell.